This innovative design steers off one side, creating very little bump steer that would occur using a traditional rack & Pinion. There is no play in the rack travel, as it is smooth and consistent through out the length of its travel. 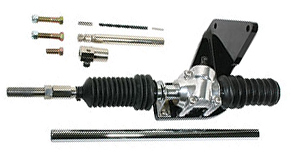 This means Cross Steer eliminates the tight spots and loose spots so common with conventional steering boxes. Cross steer is available in a New Build Kit and a Retro Kit. The difference is that the Retro kit is for users replacing a Vega style steering box and includes a coupler, section of shaft and hardware. This compensates for the distance between our pinion and the Vega spline, so you can use this shaft and hook-up your column without modification, using even the same U-joint.